It was a dream come true for our family to spend Christmas at Jill’s cabin in the forest. 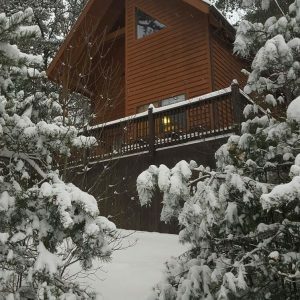 The kids loved the snow but many times didn’t want to leave the cabin and hot tub. We went snow tubing, skiing and snow boarding. The snow and ice just sparkles in the sun. We’ve never seen something so beautiful. The cabin had everything we needed to prepare meals for our large family. The kids are already asking to come back in the summer to slide down the waterfalls Jill told us about. Thanks for making this the best Christmas our family has ever had!